I have been tasked to change power options for several Windows machine in the past few weeks. I usually asked the user to log off the machine and I used remote desktop to change the power options for them. This is not very efficient and it also interrupts the user’s schedule. I found that there are at least two ways to change the power options remotely. 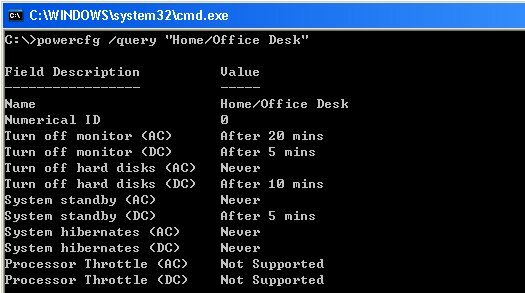 GPO: If you use Active Directory, GPO is the way to go for changing settings for a lot of machines. Unfortunately, you cannot change the power options for Windows XP through GPO natively. Only Vista supports it. You need a free third party tool to enable the function. The tool is called EZ GPO. Energy Star has an excellent article about using the tool. I first tried to download this tool, but it asked too much information about me. I ended up looking for other ways to achieve this, which leads to the command line tool. Command line: Starting from XP SP2, Microsoft has introduced a command line tool called powercfg.exe that you can use to change the power options. Energy Star again has an excellent article about using powercfg.exe. (Who else knows about power options than Energy Star? 🙂 ) To learn more about different options, type powercfg /? in a command prompt. You can use it with the the tool psexec to modify the settings for remote computers.